It’s been almost a year since I painted a face. I’ve been wanting to get back to it for quite some time. I’m so happy to finally do something new. 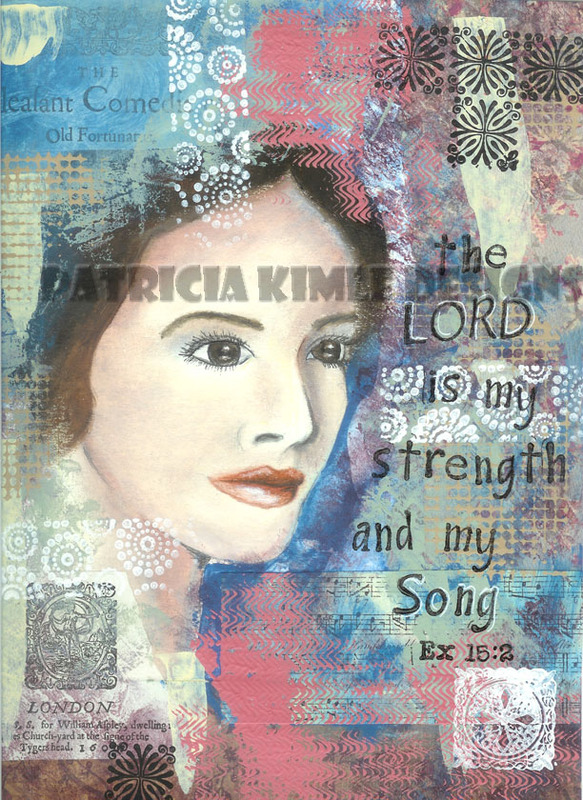 My usual pattern is to paint the face, add the collage and stamped elements and then pick a theme and a verse to use. Today I had just finished the face and was filling in the background when my daughter got home from school. I asked her input on the theme. She suggested “strength” so I went to my online bible search engine to pick the verse. Did you know there are 237 NIV verses that include the word Strength? Wow. Luckily I really was drawn to using one of the first in the list. The LORD is my strength and my song; he has become my salvation. He is my God, and I will praise him, my father’s God, and I will exalt him. Ex 15:2.